Italian Dessert – Serves 6-8. You’re going to need a good pair of Pinking Shears. 1/2 cup sweetened or unsweetened coconut, toasted (more if you want some in a bowl on the table.) OR, have a chunk of fresh coconut that you can grate over the dessert at the table! Optional: fresh blueberries, raspberries, grapes – make this once and you’ll find what color and flavor paths you’ll want to follow. 1. Soak the 2 tablespoons of tapioca in 1 cup of cool water in a small saucepan for 15 – 20 minutes. 2. Grate the rid of (1 oranges) to make 2 T. zest, a little more (1 teaspoon) if you want to add some to your Zabaione Sauce. 3. In a saucepan combine the water, sugar, agave syrup and bring to a boil, stirring until the sugar is dissolved. Simmer uncovered without stirring for 10 minutes. Add the grated rind and continue stirring for another 20 – 30 minutes or until the syrup has thickened. Remove from the heat and stir in the lemon juice. Cool while you’re finishing with the tapioca. 4. When the tapioca has (softened) cook in the water over a medium heat until the pearls just turn translucent, stirring only as needed to keep the pearls from sticking together. This should take 1 – 3 minutes. (Too much stirring will cause layers of tapioca to come off the pearls, reducing them in size.) Strain the pearls, running cold water over them to stop the cooking and add to the cooled citrus syrup. Cover and refrigerate until serving. This can be done a day ahead. In the top of a double boiler (away from heat), beat the egg yolks until thick. Gradually add the sugar, consistently beating until fluffy, light in color, and the mixture mounds slightly. Place over simmering water, continuing to beat, slowly adding the liqueur, until the mixture expands and forms soft mounds (3-5 minutes). Set the top of the double boiler in a bowl of ice and continue beating until the misture is cool. Gently fold in the whipped cream (and 1 teaspoon of zest.) Refrigerate until serving. 1. Ladle 2 – 4 tablespoons of the Bubble Sauce onto a deep dessert plate or small pasta bowl/plate. 2. Arrange the cut fruit on top as if you were placing pieces of pasta. 3. 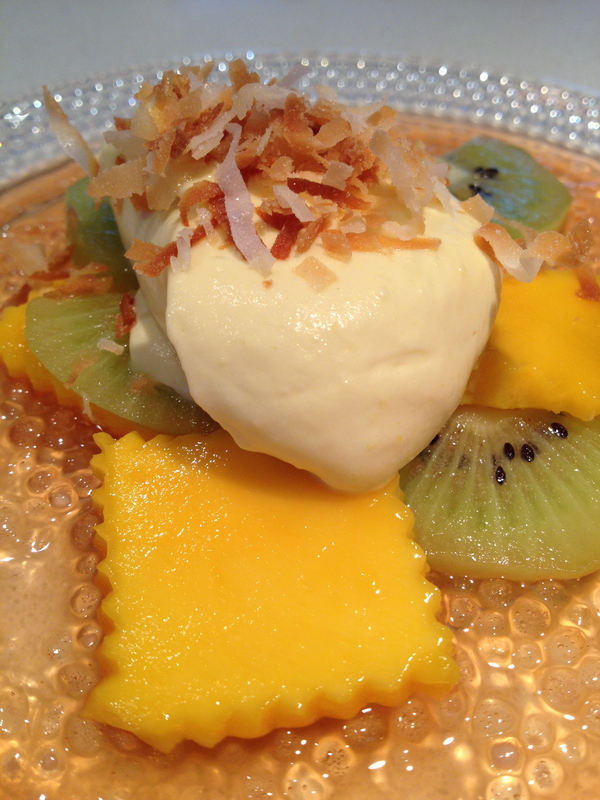 Put a dollop of Zabaione Sauce on top of the fruit, and top with toasted or fresh grated coconut. This is special, satisfying, and delicious! Enjoy! P.S. Testers who skipped the Zabaione liked it just as much as the others. Close up: so pretty, so good! Tags: Easter Dessert, Fresh Fruit Dessert, Fresh Fruit with Zabaione Sauce, Fruit Dessert, GF dessert with Tapioca Pearls, Gluten Free Dessert, Gluten Free Fruit Dessert, How to use tapioca pearls, italian dessert. Bookmark the permalink. I really can’t tell you how cool I think your blog is; I love it! So I’m sending some blogger love your way in the shape of a blog award nomination. No obligations, just admiration of your wonderful hard work! That looks absolutely delicious – I’m hungry just looking at it! Just wow. That mango ravioli looks good! Lovely idea.